Standard lockers, steel lockers, electronic lockers and the list of storage solution extends up to varying demands of the world. When you have a wide range of options in the locker industry you are bound to find a storage solution that stands true to your requirements. Today, let me walk you through one such storage solution that has a strong place in industries where the need for a work wear is mandatory. Food and catering industry, healthcare centers and industrial units are some of the places where the employees have to put on their uniforms during work hours. This is where the Garment and Uniform Management locker makes its presence felt. As the name suggests these lockers are generously used to store the work wear of the employees. Soiled garments or freshly washed garment, you get to give them a place of their own. This immensely helps in bringing about a sense of organization in the workplace. Also, when all the dirty and clean clothes are kept in a place of their own you get to prevent the chances of cross-contamination, making way for a healthy environment. Let me walk you through some of the interesting features of the Garment and Uniform Management Locker. Read on to find out about them. Here are a few features that you would stumble upon investing in a Garment and Uniform Management locker. Adding accessories to your storage solution not only makes them look beautiful, but also stretches their functionalities. Talking about accessories you can make use of a locker stand, bench stands, and even sloping tops. These additional pieces of equipment will immensely help you to add an extra element of usefulness to the storage option. The double door mechanism is one of the most interesting features that makes this storage option a favored choice. These storage lockers allow a two-way access to garments. This locker allows the access to all the compartments with one key so as to make it easy for the laundry person to manage the distribution of garments. In addition to this, it also allows individual access to the compartment allotted to the employees. The individual compartment has an individual owner, limiting other employees to get an access. As each and every employee is allotted a definite place for their work wear, the chances of theft or misplaced garments begin to take a back seat. This would considerably save the company’s expenses as they need not spend on work wears that have either been misplaced or stolen due to lack of proper storage facility. Convenience is yet another important intangible feature that is accompanied by this storage solution. Be it collecting all the soiled or dirty clothes by the laundry management person or getting an access to fresh garments, the process is quite effortless in nature. This generously contributes to making the work environment quite effective and productive. These storage lockers comprise of a multitude of compartments. You can choose lockers with the number of compartments that you wish to go for. From as less as 4 compartments to more than 10 compartments you get to lay your hands on your most favored option. All these compartments are accompanied by an individual lock system that considerably makes it easy for the employees to access their garments. These lockers are available in a wide range of colors. You get a chance to choose colors that not only coordinate with the surroundings, but would also enhance the decor. Healthcare, food industry, hospitality, and pharmaceuticals are some of the examples where you will find the need for a garment and uniform storage locker. Lighter or rather sober colors would perfectly complement the healthcare industry. Whereas the food industry could very well opt for some vibrant colors. These lockers can be accessed by the employees as and when the need arises. There is no restriction to the number of times or rather at one’s convenience. This makes it easy for the employees to work in an organization that has mandated the use of work wear. As each and every employee is allowed their keys, they can easily access their respective garments as and when the need arises. These storage solutions are all generously coated with Active Coat, a powerful anti-bacterial powder, that makes sure to keep all the harmful bacteria’s at bay. 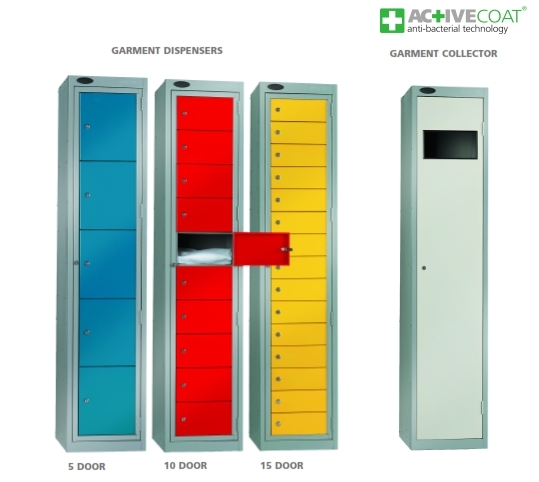 Garments are extremely sensitive to germs and bacteria and hence it becomes necessary to look after their well-being and an Active Coat smeared storage solution would be the perfect choice to consider. Above-mentioned are some of the interesting features that you will come across with the Garment and Uniform Management locker. On that account, such type of storage solution would prove to be an absolute choice for a place where work wear is important. This entry was posted on Monday, May 7th, 2018 at 4:59 am	and is filed under Lockers. You can follow any comments to this entry through the RSS 2.0 feed. You can leave a comment, or trackback from your own site.